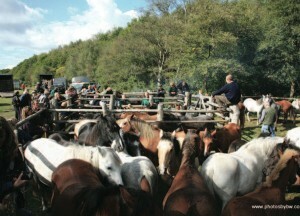 Drifts are the annual round- ups, organised by the Agisters, where the commoners’ animals are herded into pounds and marked (see M). There are lots of reasons for rounding-up animals: to worm them, to brand them, to check their condition, to get them off the Forest if they are unwell, or to take them to a sale. Drifts can be dangerous for spectators, and there can be problems when people get in the way of the ponies being rounded-up. So take care when you see the warning notices that are put out by the Agisters, and please keep clear of the drift if you’re not one of the official helpers. Dogs. Many people walk their dogs on the Forest, and most keep them under control. But dogs have killed and maimed commoners’ animals, so make sure your dog is under control. In the Forest some birds nest on the ground or low-down in the bushes, so walking your dog on a lead during the nesting season is a good idea. 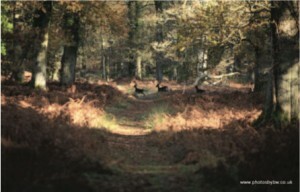 The New Forest Dog Owners Group (NFDOG) has common-sense advice about dogs on the Forest. Deer are truly wild, unlike the Forest ponies that belong to the commoners. There are five different types of deer in the Forest: Fallow, Muntjac, Red, Roe and Sika. The sika deer are from Japan (sika means deer in Japanese). The Keepers (see K) have to control the numbers of deer, otherwise there would be too many for the Forest.